News has been swirling around the nation’s capital lately, but not all about the upcoming presidential election. Woodrow Wilson High School had its share of controversy in recent weeks after new principal Kimberly Martin instituted “prior review” for the school newspaper, requiring her advance approval of any Wilson Beacon stories in print or online . 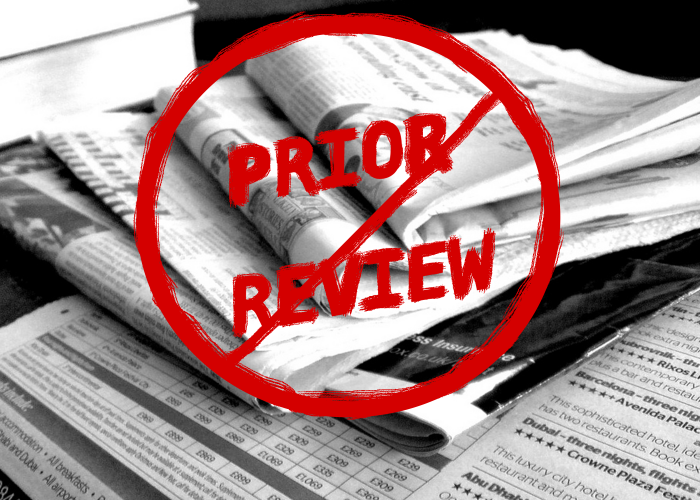 Prior review is inherently flawed and fails to consider journalistic ethics — Martin shouldn’t have implemented this policy at Wilson. Co-editors-in-chief of The Beacon Erin Doherty and Helen Malhotra released a scathing editorial on The Beacon’s website criticizing Martin and urging her to reevaluate her decision. In response, Martin agreed to consider repealing the policy if The Beacon employs stricter editorial standards, including consistent quote and fact checks. However, until Martin officially recalls prior review, the fundamental ethics of journalism will essentially be non-existent. For the good of its school newspaper, Wilson high’s principal shouldn’t institute prior review. Graphic by Naba Khan. Prior review impedes Beacon writers from adhering to one of the core values of journalism: timely news. Newspapers work to inform the community of important events quickly and serve as the primary source for crucial information for many communities. It’s unrealistic to expect a principal to quickly sift through every single article so that it’s still relevant when finally published. This guarantees delays in publishing news. Sending articles through the administration also ensures that controversial topics will receive less coverage. As students mature, meaningful debates play a key role in allowing each student to develop his or her own views. By enforcing prior review, fewer of these crucial conversations will ever take place, preventing students from developing opinions before entering the professional world. The Beacon has never been pre-approved before, and the imposition of this requirement implies that students aren’t trusted. As the leader of the school, the principal sets as an example for all students and by indicating that students aren’t trusted and instituting prior review, she sets a poor precedent for relationships between the administration and students. Supporters of prior review argue that scandalous or factually incorrect articles reflect poorly on the school. Yet, operating a successful paper includes learning how to address mistakes. Denying students this opportunity only ensures they will never grow as credible journalists. Based on the precedent set by Hazelwood v. Kuhlmeier, Martin has the right to establish a policy of prior review. However, as part of of the Student Bill of Rights, students in the District are protected from any school official editing the paper unless it interferes with another’s rights, according to Adam Goldstein of the Student Press Law Center. Unless The Beacon has significantly harmed the reputation of the school, which it hasn’t, Martin isn’t justified in the installation of the policy. High schools should support student journalists, stepping in only when absolutely necessary. Although Martin has begun to cooperate with the staff of The Beacon, it isn’t enough. Unless The Wilson Beacon can report without prior review, it will be difficult for The Beacon to shine an unfiltered light on the news.